I imagine that all Gizmodo readers regularly exercise like fiends, so these cycling gloves may prove to be quite useful for many of you. 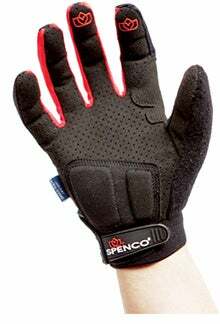 The Spenco MTB Heat Wave, Trail Pro and Cold Snap help prevent the sensitive nerves in your hands from being agitated via special gel pads in the glove. The gel pads absorb the shocks and jolts that occur as you tear up the trails. The MTB gloves come in three models for different weather situations: the Cold Snap is for those cold as a witch's teat days; the Heat Wave is for excessively hot days; and the Trail Pro is for those everyday good weather days. These "Shock-Tek" technology gloves can be had for $30-40, depending on size and model.